The Dragon Quest series is gaming's greatest immovable object. While many franchises can be accused of repetition, no series has ever remained so close to the tree it fell from as this legendary collection of role-playing games. The same mechanics, the same artist, the same monsters, the same battle screens, Dragon Quest has never yielded to evolution, proudly digging itself into the turn-based RPG trench and refusing to come out. The thing is, most fans like it that way. I like it that way. Dragon Quest has never needed to change because Dragon Quest is just that damn good. Then along comes Dragon Quest IX: Sentinels of the Starry Skies, and things take a slight turn for the different. The core mechanics are as static as ever, but there is something distinctly Western about this chapter of the classic Japanese series. It looks like Dragon Quest, it smells like Dragon Quest, but when it comes to the taste, there's a hint of something else in the flavor. Something that tastes ... good. 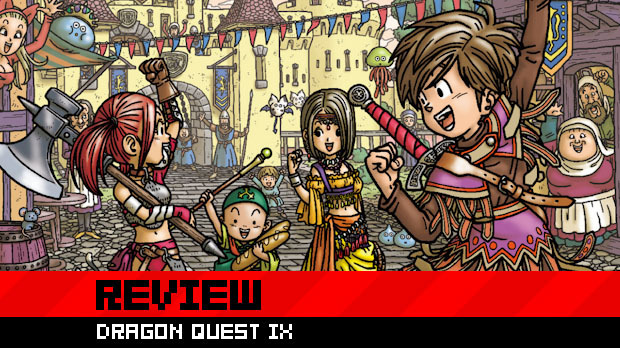 Read on for the full review of Dragon Quest IX: Sentinels of the Starry Skies. Dragon Quest IX contains all the familiar trappings you've come to expect from the series. Taking on the role of a guardian angel who's lost his wings and ended up among the mortals, players will do the things they have been doing in Dragon Quest since the dawn of time -- uncovering sinister plots, meeting and helping an eccentric cast of characters, beating a silly collection of monsters, and being subjected to some of the most hilariously terrible puns in videogame history. 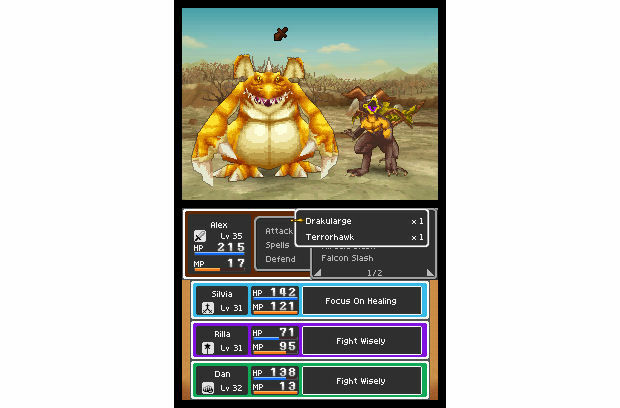 However, all is not familiar in Dragon Quest IX, a game that manages to blend elements of both traditional Japanese and Western RPGs together to create something quite special indeed. While there's definitely more East than West, Dragon Quest IX's character customization system, four-player co-op and huge list of sub quests makes it feel like Blizzard or BioWare accidentally sneezed on the game. In a good way, of course. The major downside is the fact that co-op is local only. Online functionality would have made this perfect, but of course it's very difficult to enjoy the co-op when you need three people with both a system and an individual copy of the game. If you don't have any friends, you can build your own fully customizable party at the Quester's Rest Inn, using a simple character creation system. You can choose hairstyles, hair colors, eyes, faces and various heights, as well as indulge in the new "Vocation" system to make a party with various skills and abilities. Vocations are very much like Jobs from the Final Fantasy series, and at a later stage in the game, players will be able to change their class, earn brand new vocations, and gain an entirely new set of skills. This new level of customization is a very welcome change of pace, and while some players may miss having a group of story-relevant party members, I love being able to create my own hero and his three allies. 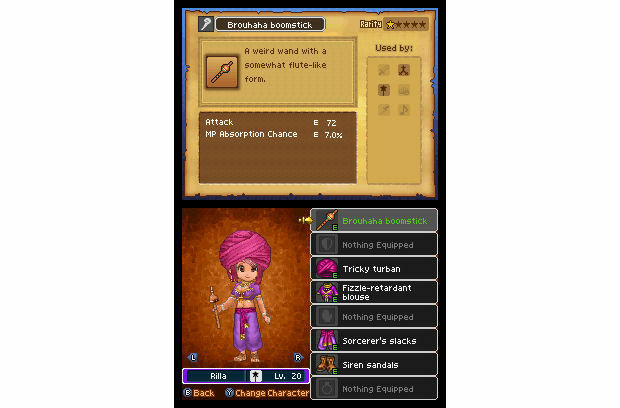 Dragon Quest IX feels so much more personal than previous games, which is a perfect fit for a handheld. More than before, you feel like you've got control over the adventure, despite the rigid linearity of the story. Again, it's that slight Western influence that makes DQIX feel much more different than it actually is. The game starts with six Vocations -- Minstrel, Warrior, Mage, Thief, Martial Artist and Priest, all of which act how you'd expect (Warrior is built for defense, Priest uses healing magic, Martial Artist is fast and has high attack). As the story progresses you'll be able to undertake subquests in order to unlock more unique Vocations such as Paladin, Armamentalist or Gladiator. Be warned though that if you change Vocation, your character starts its new life at Level 1 and you'll have to grind all the way back up again. If you find you're not pleased with the new job, you can always switch back, however, and remain at the same level you were before you switched. Strangely, lower level characters earn less experience points than higher level ones, but since they need less XP to level up, they tend to catch up quickly, even if they'll always be one or two levels behind the rest of the party. The problem with the Vocational subquests, and indeed, most of the subquests in the game, is that they often demand far more time and patience than any game should really ask of a player. The in-game mission briefings also have a tendency to be rather vague, meaning that you sometimes don't even know how to pull off the lengthy and repetitive task being asked of you. After spending far too much of my precious time attempting to make an Infernal Armor kill itself by attacking my Paladin's body spikes (at 1 HP's worth of damage a shot) I decided to simply give up on subquests altogether and stick to the main game. Fortunately, the main game itself is sublime and has so much content that the subquests are purely an extra detail. 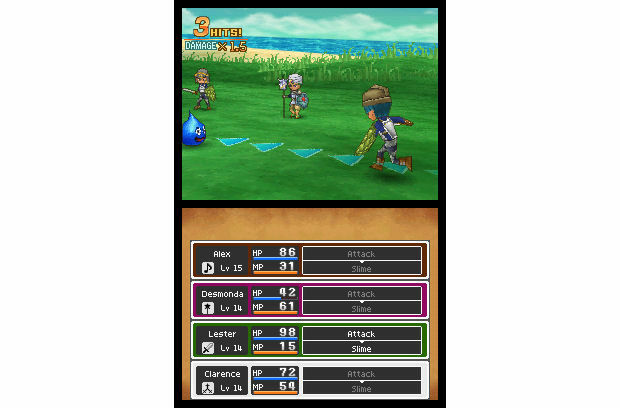 Dragon Quest IX's world is huge, and as players traverse it and perform good deeds in an increasingly allegoric manner, they will appreciate just how large a game is hiding away on such a tiny cartridge. Each town and city has its own quirky characters, humorous dialog, and awful wordplay, not to mention its own self-contained story which the player will have to get involved with. The game just seems to get bigger and more overwhelmingly immersive the longer it's played, and fans of old school RPGs will be thrilled. As always, the battle system is unapologetically turn-based, and will be familiar to anybody who has played a previous game. Very little has changed, save for a new "Coup de Grâce" ability unique to each Vocation which confers special bonuses under certain battle conditions. Outside of that, it's your usual turn-based affair, with characters and monsters trading blows until all are dead. After battle, you gain EXP, level up, and invest Skill Points into your chosen vocation or weapon, unlocking new abilities and stat upgrades. Of course, Dragon Quest IX preserves some of the series' less savory elements as well. As always, huge amounts of grinding is essential, especially when players visit a new town and have to save up thousands upon thousands of gold coins in order to buy the latest selection of armor and weaponry. As already stated, each Vocation change starts the player at level one, meaning further grinding is necessary if you ever want to upgrade to a new job. 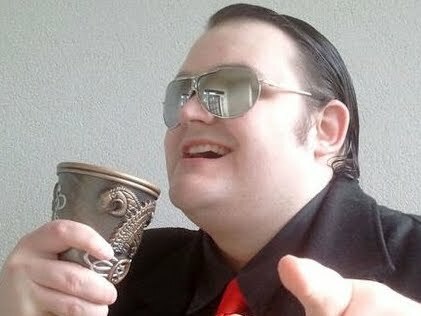 Other problems include the same old inconvenient menu system that makes buying and selling items take longer than it should, an increasing array of annoying enemies that dodge, counter, block, call for backup and do all they can to turn even the most random encounters into a long and irritating slog. Of course, if you like grinding and are prepared for how Dragon Quest's monsters operate, than half of these aren't even issues. It's also worth noting that IX is considerably easier than past titles and, while atill putting up a fight in places, it won't utterly humiliate and punish you from beginning to end like the last major game in the series did. It's a perfect game to ease into the series for newcomers, while franchise veterans have earned an easier ride after years of old school torment. IX isn't about getting "owned" and beaten down. It's about having a good time, and on that count, IX delivers like no other. Dragon Quest IX is also the most beautiful 3D game I've ever seen on the DS. Usually, 3D models look utterly dreadful on the humble handheld, but the cel-shaded visuals of DQIX, along with that fantastic art direction, makes for a thoroughly gorgeous little game that is both incredibly cute and easy on the eyes. The music isn't quite up to the Dragon Quest standard, but it's still a fun and upbeat soundtrack, the kind you'd expect from Japan's least serious long-running RPG franchise. 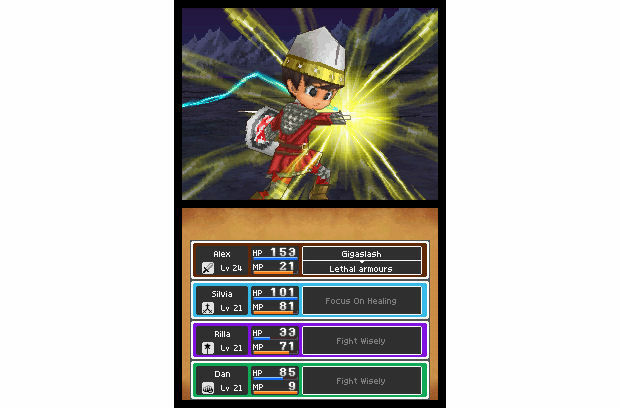 Dragon Quest IX: Sentinels of the Starry Skies is one of those games that remind you why you became a gamer. Incredibly fun, funny and addictive, it exudes charm from every pore and reintroduces the concept of giddy excitement in games with each new step taken. Finding a new town, buying new weapons, and unlocking new skills provide a simple, innocent thrill that has been missing from Japanese RPGs for the longest time. Probably since Dragon Quest VIII was released, in fact. If you fundamentally hate Dragon Quest, you may not want to pick this up, but for everybody else this is a must buy. It's simply the best DS game of the year and one of the finest RPG experiences you could hope to own. Only the most jaded of gamers could play this game and not smile.